The name Penge derives from Celtic words meaning ‘head of the wood’; Pencoed in Wales has exactly the same origin. This is one of the few Celtic place names in London and suggests the survival of a native British contingent after Anglo-Saxon colon­isation. In 957 King Eadwig (or Edwy All-Fair) granted the manor of Battersea to ‘Lyfing, his faithful minister’, together with swine pasture at Penge, which remained a detached portion of Battersea parish for more than a thousand years. Gypsies continued to make camp in the woods here until the early 19th century, when the construction of the Croydon canal brought day-trippers to Penge and Anerley, and then the first residents after the enclosure of the common in 1827. The canal was replaced by a railway in 1839 and Penge (now Penge West) station opened but soon closed again, owing to the lack of passengers. Almshouses for retired members of the Worshipful Company of Watermen and Lightermen were built in 1840, “when Tudor was the inevitable style,” as Pevsner puts it, adding that “Penge is for most people a joke, an epitome of the dreary suburban non-place. It is a reputation not quite deserved [faint praise? ], and a journey down the hill to the High Street yields several buildings worth a look.” These include another set of Tudor-style almshouses: Philip Hardwick’s King William Naval Asylum, which was paid for by Queen Adelaide and founded in 1847. The church of St John the Evangelist was consec­rated in 1850, when the population of the village had risen to over a thousand, including the residents of the two groups of almshouses. Soon after­wards, the relocation of the Crystal Palace to Sydenham brought explosive growth to the area. The station reopened in 1863 and the London, Chatham and Dover Railway opened another station in the same year, which lay within Beckenham and is now called Penge East. In 1866 the Duke of Westminster sold Porcupine Field on favourable terms to the Metropolitan Association for Improving the Dwellings of the Industrious Classes. The charity laid out its only ‘country estate’ here, which it named after Alexandra, Princess of Wales. The Alexandra recre­ation ground (shown in the photo­graph on the right*) was laid out by the council in the late 1880s and opened c.1891. Because Penge lay on the lower slopes of Sydenham Hill, specu­lative developers generally built smaller houses than in the heights of Upper Norwood or Upper Sydenham and this contributed to a high density of population. 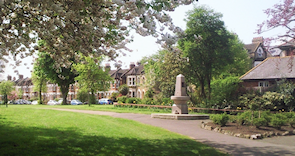 Penge became an urban district in 1900 and was trans­ferred from Surrey to Kent. The area was very badly damaged by bombing during the Second World War and of the several consequent recon­struction projects the largest was the council’s Groves estate, now regen­erated and run by Affinity Sutton. According to the 2011 census, only 66 per cent of the residents of the Penge and Cator ward are white (down from 78 per cent in 2001), a very low proportion in comparison with the rest of the borough of Bromley. The principal minor­ities are of black African and black Caribbean descent. John Mortimer’s irascible barrister Horace Rumpole regarded the Penge bungalow murders case as his greatest triumph; the full story was finally revealed in 2004. 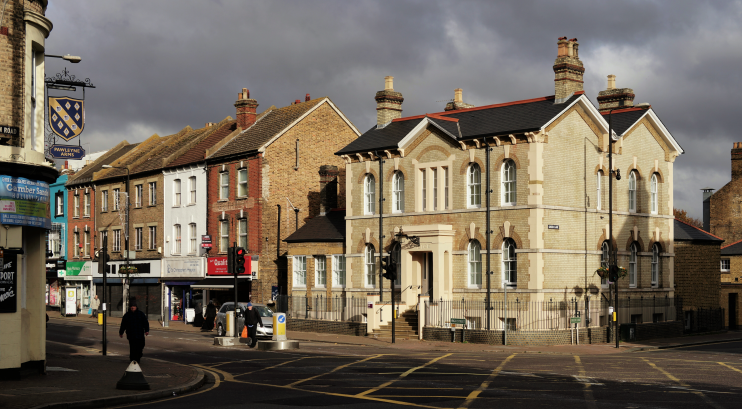 * The picture of the junction of Penge High Street with Green Lane at the top of this page is adapted from an original photograph, copyright Peter Trimming, and the picture of Alexandra Recreation Ground is adapted from an original photograph, copyright Marathon, both at Geograph Britain and Ireland, made available under the Attribution-ShareAlike 2.0 Generic Licence. Any subsequent reuse is freely permitted under the terms of that licence.